As you all may or may not know, I just got back from a holiday in Tokyo, Japan! This will have been my second trip to Japan, but my first trip to the countries capital, Tokyo! This was also the first solo vacation that me and my boyfriend have ever been on, so that was also very exciting! 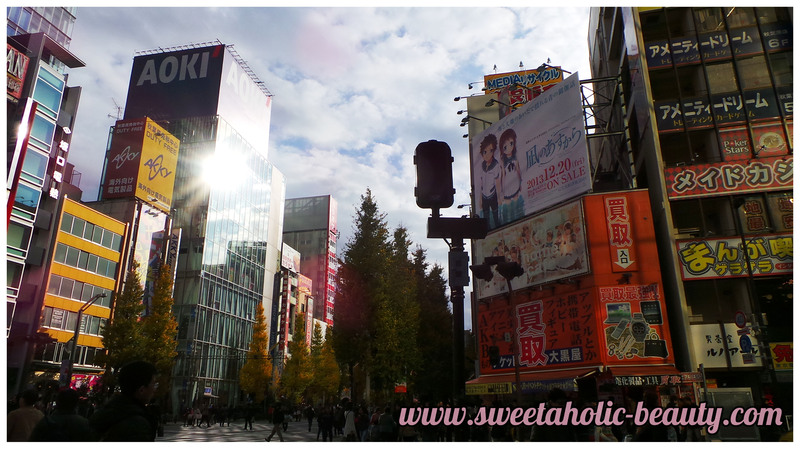 We stayed in a hotel a five minutes walk from Shinjuku station, as that was primarily where we wanted to visit! There are lots of parts of Tokyo, but this was closer to Harajuku and Akihabara; places both my boyfriend and I really wanted to visit! 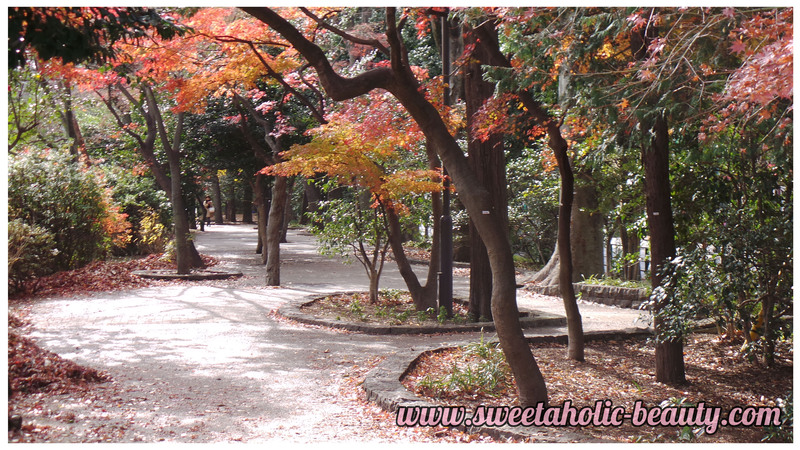 I didn't take as many pictures as I would have liked, as I was too busy experiencing the awesomeness that was Tokyo! 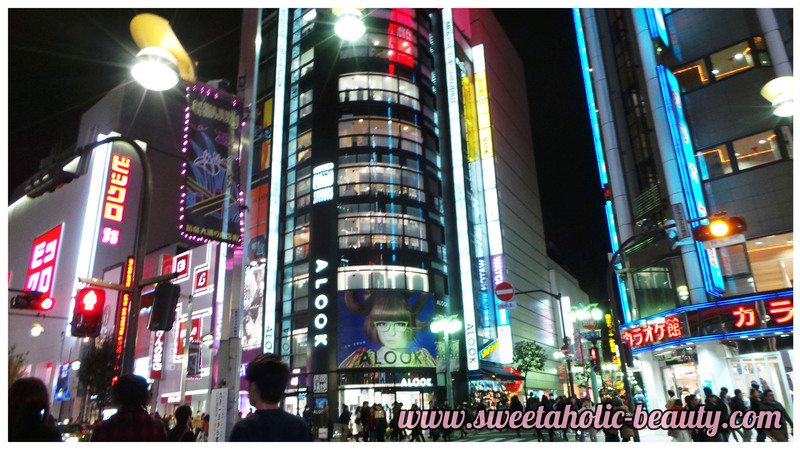 Shinjuku at night was my absolute favourite! All the shops stayed open until 10:30 every night, and even later on a Sunday! This meant that the streets were crazy busy with normal people (as in not the disgusting drunk/crazy people you find in Melbourne) which was definitely awesome! 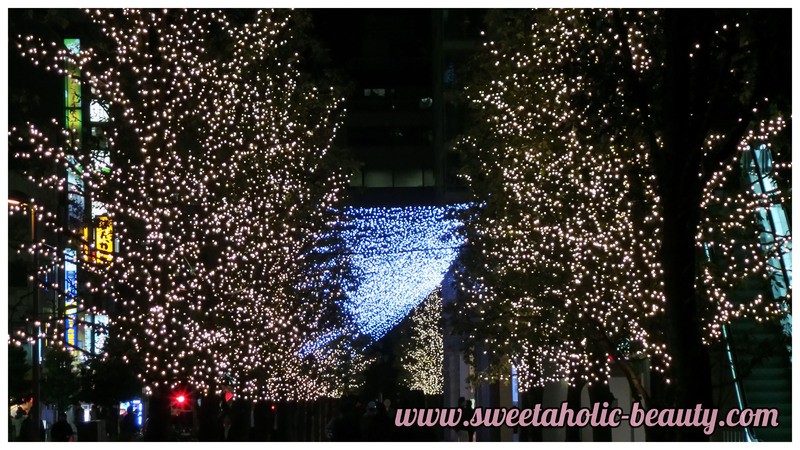 The Christmas lights outside Shinjuku station were so cute! Everywhere really got into the spirit of Christmas! Still can't get over people walking the streets and shopping at 10pm! 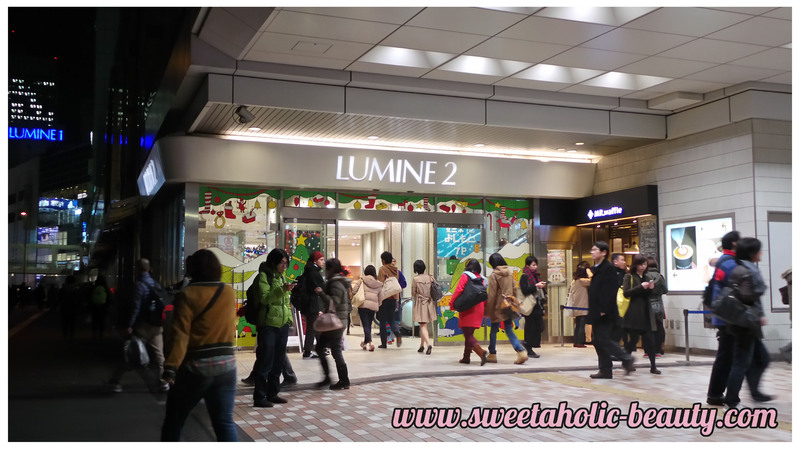 My absolute favourite place to shop was the Lumine shopping centres located in Shinjuku station. We're talking eight levels of beauty and fashion for each three Lumine centres; Lumine 1, Lumine 2 and Lumine Est. As a compulsive shopper, I was in my prime! It was really easy to get lost inside though, but that just made it all the more fun! Akihabara was my boyfriend's favourite place to shop! This place was full of gaming and anime goods, which was pretty awesome. All the skyscrapers were plastered with advertisements filled with anime characters! Super Potato is a must when visiting Akihabara, and I was not disappointed! This place was jam packed with old school games, as well as consoles, at pretty decent prices! I wanted to buy some games for my Super Nintendo console but my boyfriend reminded me that they will be in Japanese; fail. Even the hallways were decorated like crazy! This place was awesome! 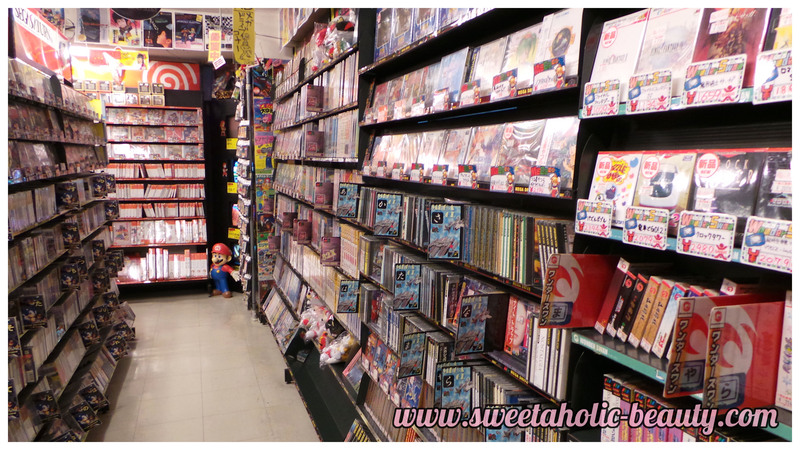 My favourite place in Akihabara was this amazing hobby shop. It had everything, and they even let you take photos in the store! 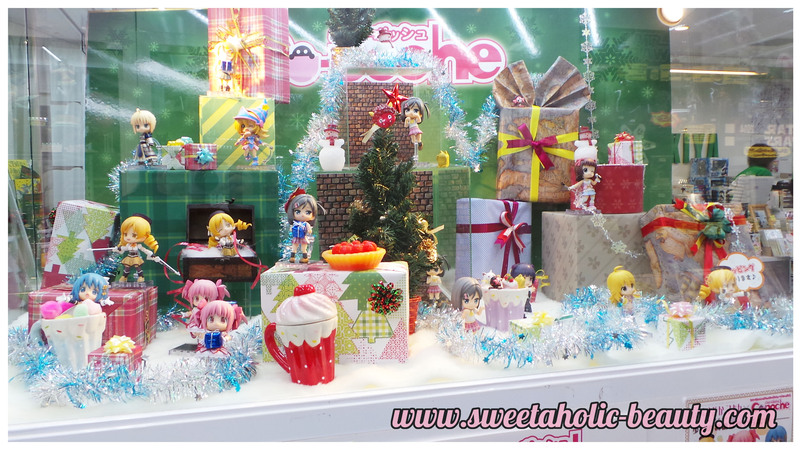 I took a bunch, but heaps that you probably wouldn't be interested in, so I'm just sharing one of this cute Christmas chibi display they had up! Spoiler alert; my boyfriend bought me one of these figurines, but I won't tell you which one yet! In my entire stay in Japan, this place was where I saw the most Westerners. 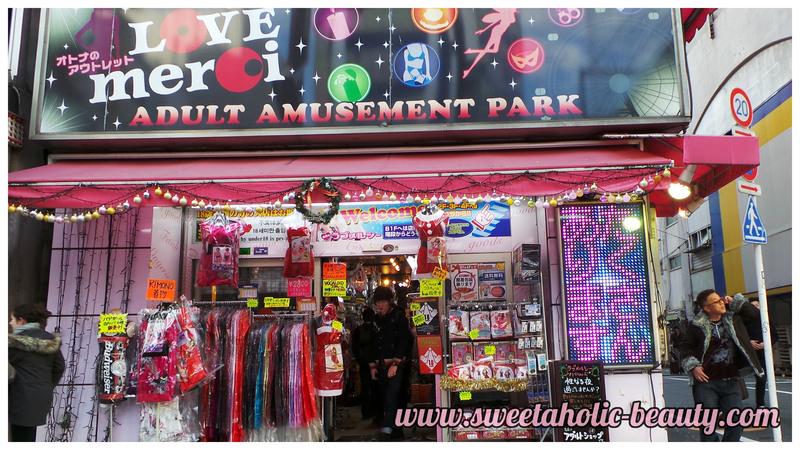 Yes, this is eight floors of adult products called Love Merci Adult Amusement Park. I took the plunge and went inside, even went up to the second floor until I saw a sign that said: "Women not allowed on 3rd & 4th floor." I think I'm scarred for life! 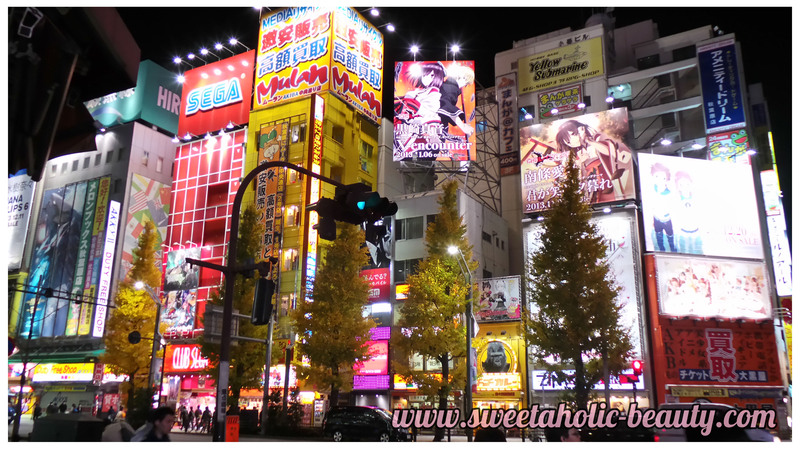 Akihabara really lit up at night, and it was like nowhere I've ever seen before! 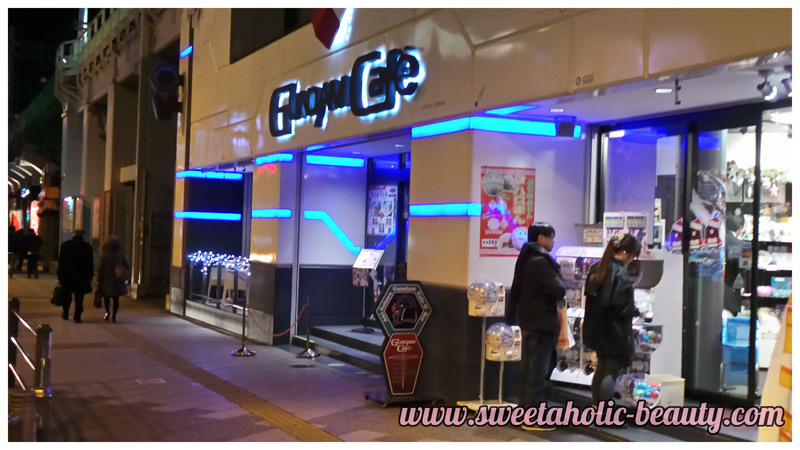 We found the Gundam Cafe. It seemed a tad boring inside, so we decided to skip eating here this time around. 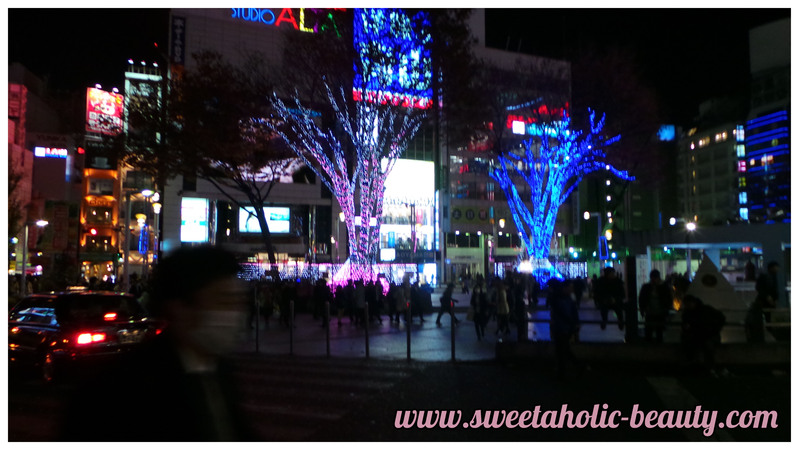 The pretty Christmas lights in Akihabara were amazing! 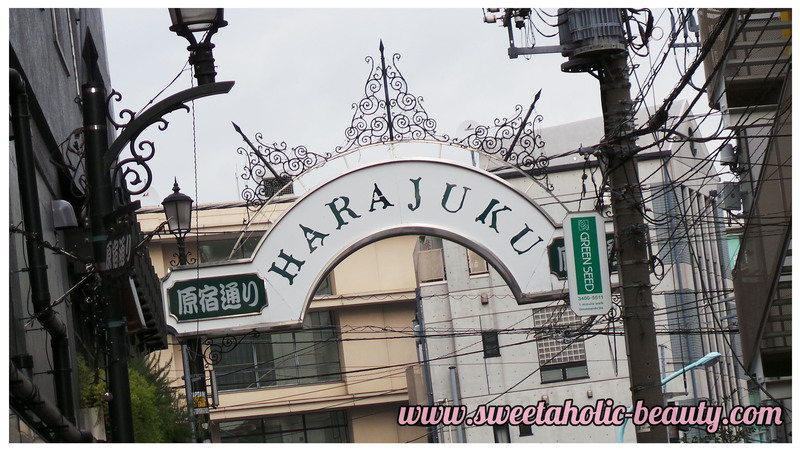 Harajuku was easily my favourite place we visited. The station looks absolutely adorable, and with all the autumn trees (even though it was technically winter) it looked like something out of a story book! 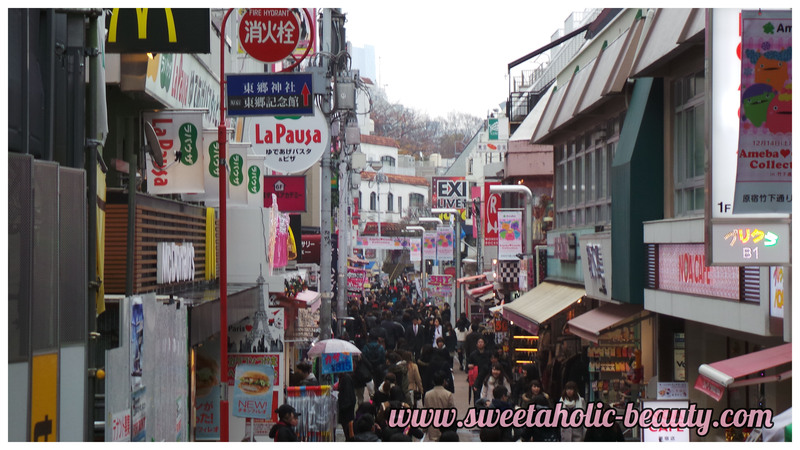 Harajuku was very popular, as you can see, and there were a fair few sightseers. Everything here was so cute, and we just kept finding more and more shops hidden away in the alleyways! 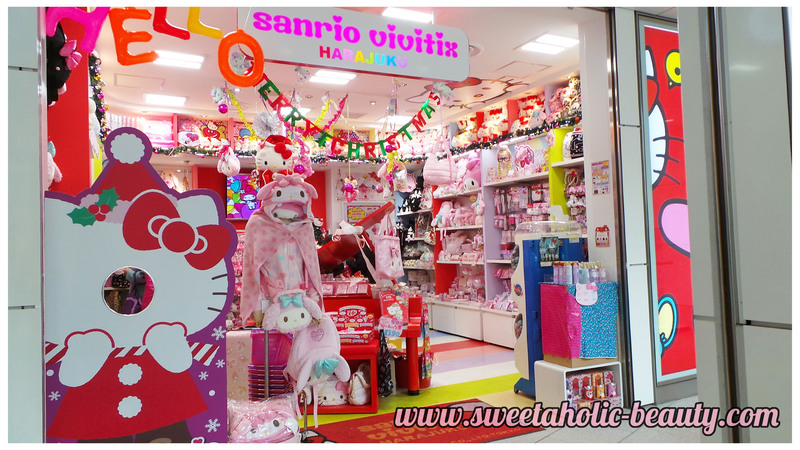 The Sanrio store in Harajuku. It was compact, but very cute! I loved this store, it was so random! I love how most of the stores also had a little mascot outside, this one had a little unicorn. Too cute! The Ralph Lauren building. It was so pretty looking, and even the designs in the windows were amazing, but I completely forgot to take pictures! Sorry! Some shops in an arcade. I wanted to buy everything from LoveToxic! This was one of a few shops that dedicated their fashion to dogs. Yes, dog fashion! I really wanted to buy my dogs some outfits, but my boyfriend pointed out that I had no idea what size my dogs were, also he thought it was embarrassing. But next time before I go, I'm measuring my doggies and buying them some cute outfits! 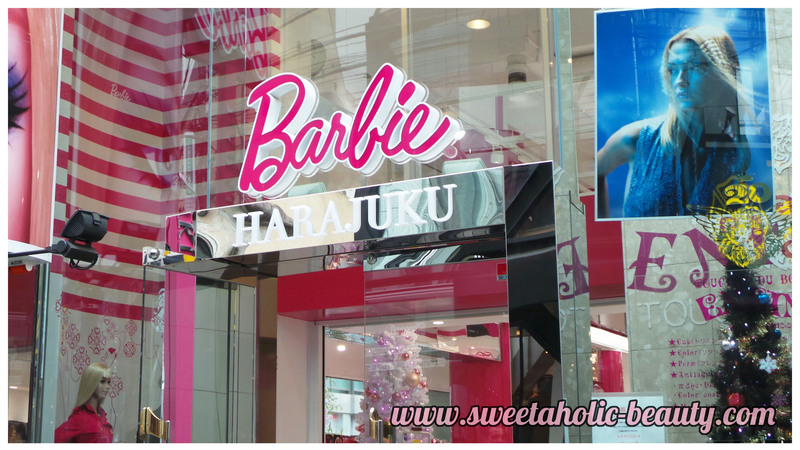 I found the Barbie store! I've been in love with Barbie ever since I was a kid, and always collected the dolls. I love Barbie stuff even now as an adult, so this was fun! They had a few lifesize Barbies inside, but I wasn't allowed to take pictures. 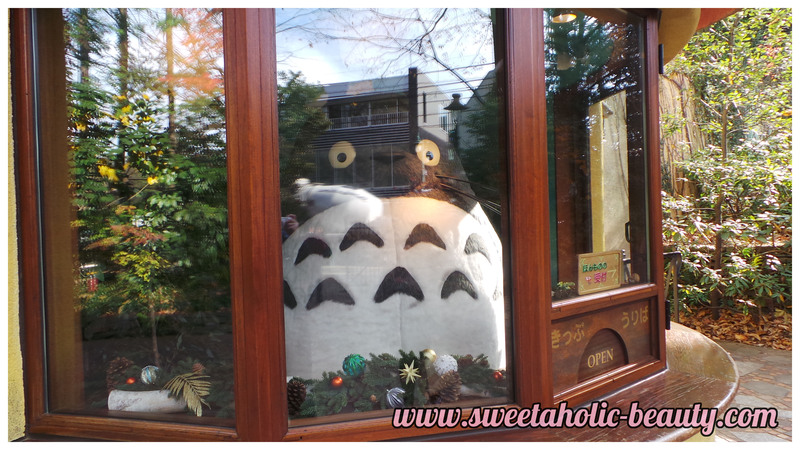 We dedicated a day to head out to Mitaka to visit the Studio Ghibli Museum. (If you don't know what Studio Ghibli is, I feel sorry for you!) We're big lovers of the movie, so this was a must have for us. The museum was in a park, which was absolutely beautiful, so I just had to take some pictures! Every detail counts, how gorgeous is this little sign! We weren't allowed to take photos inside the museum, but this was what it looked like on the outside. The museum was too cute, and I really wish I could have showed you all how much detail there was! The giant Totoro outside in a faux ticket box! It took us ages to get this photo as there was a really annoying family with a baby taking photos, and they had to take a million pictures, even though we were standing there waiting! All in all, I really enjoyed my trip to Tokyo. Even though I didn't see as much as I would have liked to, it was far nicer taking my time and exploring places more in-depth than going to a bunch of different places and only being able to stay for an hour or so. My boyfriend and I are planning on going back again next year, particularly for Christmas! I found Japan to be far more festive than Melbourne! I find that Japan is definitely a country I have fallen in love with the past two times I have visited, and I can certainly see myself going back again and again! We did go to Shibuya but I forgot my camera that day, so sorry about that! We did also go to Disneyland but I'm saving that for it's own post, as I have more than a few pictures to share from that day, so stay tuned! Have you ever been to Tokyo before? If so, what did you think? Great pics - looks like you had a fantastic trip! We went to Tokyo on our honeymoon about 7 years ago and so loved it, I would love to go back again and explore more of the city. 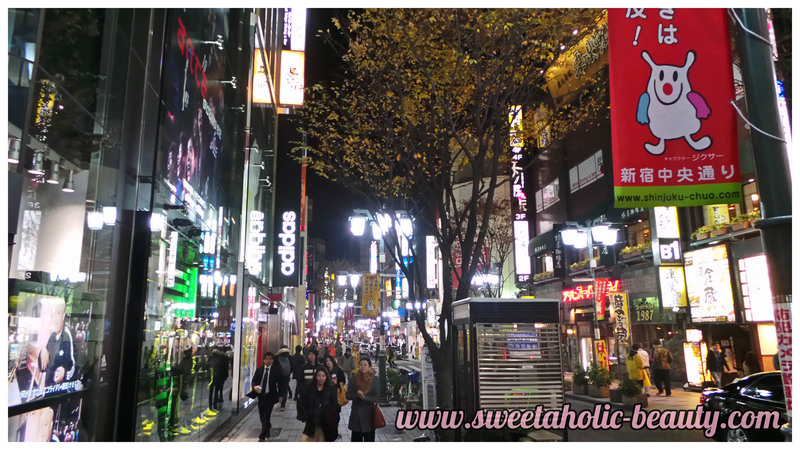 I really enjoyed reading this post ^_^ my boyfriend and I are heading out to Tokyo in a few weeks!!! We will be going to studio ghibli as well! And the parasite museum...lol. Can't wait to go to all the sanrios!!! Oh by the way, was it very cold? Aw thank you! And wow, that's awesome! I hope you guys have a tonne of fun! I didn't even know about the parasite museum, damn! I totally would have gone there! 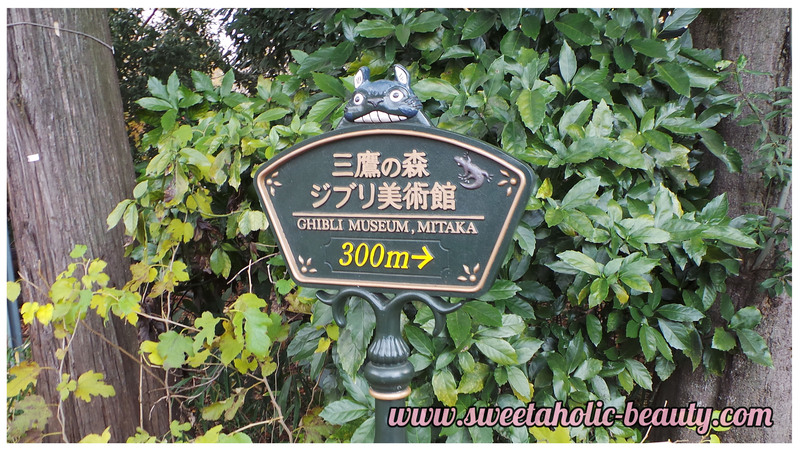 I always wanted to go to the Ghibli Museum!! I love Totoro! I haven't been to Japan yet but it is on my list of places to visit. I want to go check out all the pretty cherry blossoms. Awesome photos! I've always wanted to go to Japan! Hopefully I'll go soon hehe! That adult shop seems super scary though eek! I loved Tokyo too. When we went to Harajuku we watched these guys dressed up as Elvis doing a dance off. It was so interesting and funny. They did it every weekend. I feel like you need a good 2-3 weeks to really experience Japan. There's so much to see and do. I love that there's so much culture, both new and old, to experience. I so wish I knew someone that would visit Tokyo with me!! How kawaii! Everything's really bright and pastel coloured - so jealous! I am so jealous of your trip, it looked absolutely amazing! Anyway, looking forward to reading more about your Japan trip! Wow, it looks amazing! I want to go to Tokyo now!